With the European leg of his Believe tour underway, Justin Bieber visited the Anne Frank Museum in Amsterdam, writing “Truly inspiring to be able to come here. Anne was a great girl. Hopefully she would have been a belieber,” in the guest book. No one took the time to ask Justin if he meant that in the hypothetical context of her existing now, in 2013, or of him existing then. I think we’re going on his new knowledge that she was a teenager, and LIGHTBULB: teenagers love Justin Bieber. 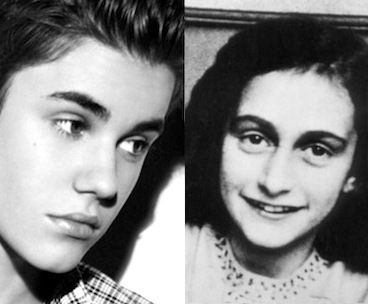 The good people at the Anne Frank House forgave The Biebs for suggesting that you have to be a fan of his in order to be “great,” telling BBC that what he said wasn’t “sensible” but that he “didn’t mean bad” because he’s 19 and living a “strange” life.